What Does the Future of Self-Driving Cars Hold for Tech Talent? Google’s parent company, Alphabet, recently moved its autonomous vehicle project from Alphabet’s research lab X into a standalone company called Waymo. And last year in Austin, Texas, the company completed the first fully driverless ride on public roads with a blind passenger in a car with no steering wheel or pedals. Meanwhile, tech giant Uber is testing self-driving cars in the Pittsburgh, Pennsylvania area. Uber customers in Pittsburgh may find themselves being ferried to their destinations in a self-driving vehicle that also has a human on standby in the driver’s seat. Rumor has it there are a few Uber self-driving cars tooling around the streets of San Francisco as well. It would appear that the future is now. While Detroit may be the automotive nerve center of the country, it turns out that the heart of the future automotive industry may indeed be in San Francisco. Mechanical engineers are still the dominant force in Michigan’s automotive plans, but software engineers are at the center of automotive innovation in Silicon Valley. Though the automotive industry has long been considered by some as a slow-moving industry as far as technological innovation is concerned, automakers are picking up the pace to put the rubber to the road with autonomous vehicle technology. Meanwhile, General Motors has sunk more than $1 billion in a couple of California tech companies in its bid to keep pace with Google and Uber in the race to self-driving innovation. Having bought a 9 percent stake in Uber competitor Lyft for a whopping $500 million, General Motors went on to spend more than $1 billion to acquire Cruise Automation, a company that writes the software for autonomous driving. Fortune reports that, in addition to these large investments, General Motors has also introduced a car-sharing service called Maven and created an engineering team dedicated solely to autonomous driving. Palo Alto-based Tesla Motors has signaled its intent that its newest cars will go fully autonomous as early as next year. Once that takes place, the innovative company also intends to start a ride-hailing service for its fleet of self-driving cars. Not all tech talent involved in the development of self-driving cars is based in San Francisco, however. Alphabet’s Google announced in May that it will open a self-driving car research center in suburban Detroit. And Amazon opened a tech center in downtown Detroit, drawing additional tech talent to the area. Another emerging tech hub for self-driving car engineers is Pittsburgh, Pennsylvania. While this may on the surface seem odd, it actually makes perfect sense, considering that Pittsburgh is the home of Carnegie Mellon with its robotics, AI, and machine learning courses. It remains to be seen whether Michigan will be able to woo top tech talent to its door. On the positive side, Michigan’s real estate prices are considerably lower than those in San Francisco and the area is obviously hungry for tech talent. On the other hand, San Francisco is the current hub of self-driving car engineering tech talent and it shows no signs of willingness to give up that distinction any time soon. The tech talent shortage is a particular problem in the field of autonomous driving simply because the technology is advancing more rapidly than are educational opportunities. Thrun estimates that the tech industry alone is in need of about 5,000 engineers. From Detroit to Germany to Japan, Thrun says companies may be in need of some 20,000 engineers. Considering that the only machine learning program in the world is currently at Carnegie Mellon, it is obvious that there is going to be an educational shortfall when it comes to equipping a new crop of engineers with the skill set needed for self-driving technologies. Udacity hopes to help fill that gap with its self-driving program curriculum. Designed collaboratively with Didi Chuxing, Mercedes-Benz, Nvidia and Otto, Udacity’s self-driving nanodegree program is not formally accredited. Rather, it seeks to provide its enrollees with the actual skill sets needed currently in the automotive industry to produce results in the self-driving engineering arena. Though almost 4,000 applicants tried to win a spot in the program upon its implementation, only 250 spots were available. There are, of course, plans to expand the program, but it is obvious that Udacity’s program alone will not be enough to adequately meet the growing needs of the automotive industry for top tech talent. As Thrun suggests, those looking for a career as self-driving engineers need a deep knowledge base in several disciplines. Paysa scours thousands of job descriptions in tech to determine which skill sets are required for various positions. Here is what Paysa found regarding the skill set needed for self-driving car engineers. Many of these skills require years of experience to master. For this reason, self-driving car engineers typically hold a higher educational degree than software engineers in general, with as many as 85 percent holding a graduate degree and 57 percent holding a doctorate in either computer science, electrical engineering, robotics, machine learning, statistics, and related fields. According to Paysa data, the average base salary for self-driving car engineers is $138K per year. The average market salary is $233K per year, which includes $138K base salary, $26.1K annual bonus, $21K signing bonus and $73.5K annual equity. 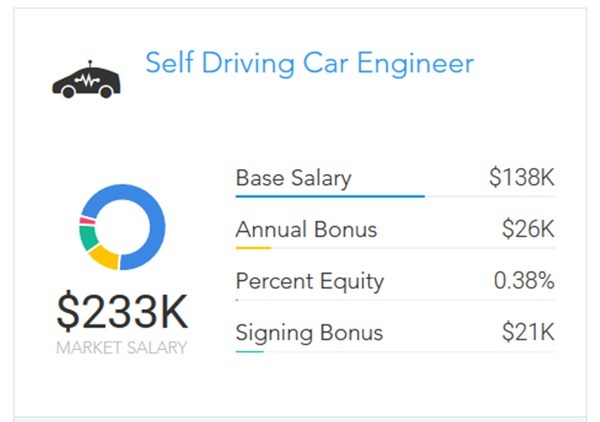 Self-driving car engineer salaries per Paysa data. Google and General Motors are both top companies looking for self-driving car engineers currently, though several other tech companies are also in the hunt. For instance, Uber, currently holding the number one spot for tech talent according to Paysa CompanyRank, has acquired Otto, an autonomous driving technology company that retrofits semi-trucks with self-driving technology. It appears that Uber has set its sights on disrupting the trucking industry with self-driving trucks, putting Uber on the list of tech giants looking for potential tech talent in the autonomous driving area. Self-driving car engineers at Google make a bit more than the average, with a base salary of $151K per year. The average market salary is $269K per year, which includes $151K base salary, $26.1K annual bonus, $23.8K signing bonus and $68.6K annual equity. The average time to promotion as a self-driving car engineer at Google is 3.3 years. 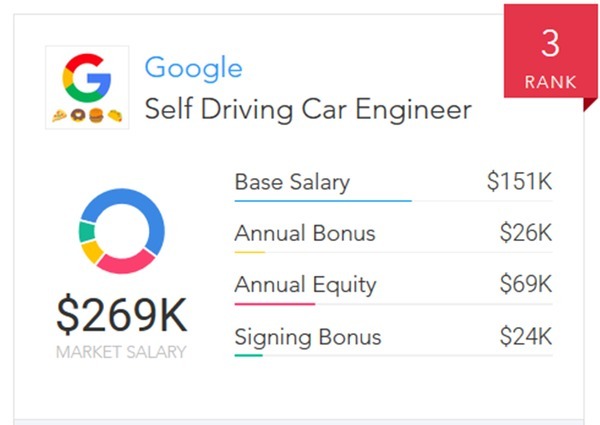 Google self-driving car engineer salaries per Paysa data. If you have the skill set required to become a self-driving car engineer, your career prospects look very good. Because the tech need is so great in this area, even if you do not have all the skills required, you may find it advantageous to pick up those skills as soon as possible. The Paysa platform can help you find out which skills will net you the most in terms of salary and career advancement opportunities. Visit Paysa.com to set up your free personalized account and get recommendations for skills and career paths, salary negotiation tips, and much more. Previous ArticleVisa vs. Square Salaries: Who Pays More? As we all know that automotive industry is growing very much due to latest technology and digital trends. This self-driving cars is one of the best example of automotive IT technology which is tremendous change in industry. Of course self-driving cars future is bright and will become a popular also. No need to ask about Driverless Car and Autonomous Vehicle Project are going to bright and successfully. As you know, the automotive industry is quickly advance last few years. Thus, all engineers are learning and grab nice experience in different way like, robotics, embedded system, AI, smart automotive hardware and software. So, keep it up for all. Go ahead and Best of Luck.